Liquid Gold. Nature’s Ancient Medicine. Over the centuries Greek olive oil has been celebrated for its quality, clarity, and health benefits. It’s more than just a product; it’s our heritage. If you love Mediterranean food, then you’ll know that olive oil is at the heart of every great dish. It’s also a key part of a healthy diet. Here in Lesvos, we take great pride in making sure our olive oil is treated with the utmost respect — every step of the way. On the Faros Estate, that starts with how we cultivate our olive trees. Each plant is grown six meters apart from its neighbor. That way, each and every olive tree has enough room to thrive and soak up the glorious Aegean sunshine. Want to know a family secret? We mix seaweed and grape compost into Lesvos’ dry, rocky, native soil; producing a quality fruit that’s non-intensively grown. Plus, it helps our abundant wild flora grow too. We produce two homegrown native olive varieties to make Ol-eve’s liquid gold: Kolovi and Adramytiani olives, praised for their almost fruity notes. We also cultivate Koroneiki olives to give our oils a distinctly piquant fragrant aroma, fusing the three flavors together. 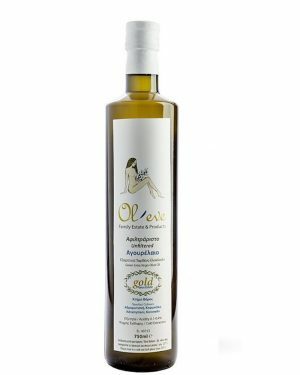 At Ol-eve, we offer three kinds of Extra Virgin Olive Oil: Conventional Extra Virgin Olive Oil -0.5% acidity, Organic* Extra Virgin Olive Oil -0.5% acidity, and Early Harvest Organic* Premium 0.1-0.3% acidity. Lesvos’ olive oil is superior in many ways (really, it’s true) due to the island’s microclimate, its rich flora and rocky terrain, and our cultivation techniques. It’s rich in carotenoids, has the most naturally aromatic bouquet and is the lightest color olive oil you’ll find in Greece. This makes it very easy to digest and a great cooking companion. Its low chlorophyll, low-acid content means it can be preserved for longer. We put a number of quality control techniques in place to ensure our olive oil maintains all of its nutritional characteristics. We’ve perfected our harvest technique; use technologically-advanced pressing facilities; and send samples for analysis in accredited International Olive Oil Council (IOOC) laboratories. We always use the right storage methods. We decant our oils into dark glass bottles or metal tins which are transported in temperature-controlled conditions. We never use plastic packaging for our olive oils as it carries a high risk of adding plasticizers to the olive oil. Transparent bottles are also not our thing, as the olive oil oxidizes much easier in them. We insist that you store your olive oil only in cool and dry places, away from sunlight and high temperatures.. Olive oil is packed with Vitamins E (Tocopherol), D, and K; and has a high concentration of polyphenols (mainly oleocanthal and oleacein) — antioxidants. It’s also a great source of omega 3, 6, and 9 (more than 70% oleic acid). The health benefits go on… it can reduce cholesterol; maintain healthy bones; can be used as both an antioxidant and an anti-inflammatory; and can prevent a variety of ailments: cardiovascular disease, clogged arteries, as well as hair loss, dry skin; even snoring.